Home › Other Stuff Related to Books and Reading › I am one thankful kid! I got 4 blog awards! I am one thankful kid! I got 4 blog awards! ZOINKS! It all started a little while ago when Lynn Davidson of the Pollila Writes was very nice to award my blog “The Versatile Blogger Award.” As I was thinking of what to write about myself I got TWO Liebster nominations, one from Loni Edwards and one from Donna Martin of The Write Track blog! I also got a “Kreativ Blogger Award” from Beth Stillborn of the “By Word of Beth” blog! 1. Thank the person who gave it to you to acknowledge it. THANK YOU MS. DAVIDSON!!! I really like reading Pollila Writes. Ms. Davidson has some great book reviews and things about writing and she is also encouraging me as I am doing Julie Hedlund’s 12×12 challenge! Please check out Pollila Writes by clicking HERE! 2. Tell 7 things about yourself. Well…because all the awards I got have you telling something about yourself I am going to do it all in one big bunch at the end, so please read on! 3. Pass the award on to 15 bloggers. I hope you don’t mind but I am going to do a little less because I had an idea, because I am a kid blogger I am going to pass this award onto other kid bloggers that I follow! Here they are (please check them out)! Animals and Art -Josie my little sister. Josie just turned 8 and loves…well animals and art. Sir Books-a-Lot – Sir Books-a-Lot has more than a cool name! He is a 11 year old book blogger with great reviews! The Girl Named Jack – You think I write a lot?? – check out Jack! She already has a self published book and is publishing another chapter by chapter as she writes it. Radio Christian Kids – Priya is a fifth grader that writes about all kinds of things – sometimes books, sometimes cooking, sometimes a special event. I like to read what she has to say. Fami-Lit – Seven year old twins and their mom give their opinions on all sorts of books! 1. Thank your Liebster Blog Award presenter on your blog. THANK YOU Loni Edwards and Donna Martin of The Write Track blog!! Ms. Edwards is an awesome illustrator (check her website out HERE) and her blog out HERE. She participates in Susanna Leonard Hill‘s”Perfect Picture Book Friday” AND IN FACT she designed the cool badge for PPBF! See it over on my right side bar?!? Ms. Martin’s blog (click HERE to go to it) has all kinds of information about reading and writing. She participated in Tara Lazar’s PiBoIdMo and is doing 12×12. She is also a fourth degree black belt in TaeKwon Do! 3. Nominate 5 blogs you love and want to tell others about. A Spot to Read – Mrs. Duff is a Middle School Teacher and her blog is a lot of fun. She blogs a lot about books, reading and what her students are doing. Ms. Yingling Reads – Ms. Yingling’s blog is just what it says, “Books for middle school students, especially boys”. It is a great place to find a good book. Kid Lit Reviews – Ms. Morris has some great book picks and reviews! A Lego a Day – Has NOTHING to do with books. It’s a photography site where Dan Phelps, a fifth grade teacher posts pictures of….LEGOs. You really have to see it, IT’S AWESOME! NOW THE KREATIV BLOGGER AWARD!!! Tell ten things about myself and give the award to six bloggers! I hope you don’t care but I am going to put people who I have “met” that sound interesting and I want to know more about them. Diane Tulloch of The Patient Dreamer blog. I know Ms. Tulloch is from New Zealand and I’ve been learning about the place. She also has traveled all over the world! I hope she tells me more about all the cool places she’s been! Check her blog out for great book reviews! Patricia Tilton of Children’s Books Heal. I know Ms. Tilton was a news paper reporter and worked for the Navy. She sounds like a very interesting person! Ms. Tilton also always has really great books on her blog that deal with all sorts of issues kids and adults should be thinking about. I learn a lot from her blog. Joanne Fritz of My Brain on Books. Ms. Fritz is the only blogger that I have actually met in real life! I met her at a book event I went to and it says on her blog she is a survivor of a brain aneurysm. I didn’t know what that was so I read about it. Besides having a great book blog, Ms. Fritz also has a bunch of information about aneurysm. Caroline of Children’s Books and More. Miss Caroline is a teacher and a book blogger. She also posts great photos. I have followed her blog for a long time and I really like her reviews! The things about me – I did 20 things because that’s all I could think of (I think I was supposed to do more) and I tried to do things maybe you didn’t know. 1. I have a red belt with a black stripe in TaeKwon Do. I will hopefully be testing for my junior black belt in the next couple months. 2. I am learning to play the trumpet. 3. I am taking an online Latin class because I like words! 4. I collect model Hess trucks. 5. I had a sixth grade reading level in kindergarten. My first grade teacher said to my parents she thought I was going to be an excellent public speaker and she let me do presentations to the class. Now, I like speaking in public – Thanks Miss Kline!!! 7. When I am not blogging I like to play with LEGOs and do origami. 8. I played ice hockey for a couple of years. 9. I have BAD handwriting. Seriously bad. 10. I like to fish. 11. I can raise each of my eyebrows separately (this bugs my mom for some reason). 12. When we moved into the house we are in now five years ago there was an old lock on a cabinet in the basement. I wanted to learn how the lock worked so I could get it off. I can now pick all kinds of locks and I think how they work is interesting (don’t worry I won’t use it for bad purposes). 13. I was attacked by a turkey in a petting zoo in New Hampshire. THEY RUN FAST! 14. I have a mini-bike I like to ride around. 15. I don’t like soda or french fries (or tater-tots, or potato chips… BUT I do LOVE mashed potatoes! Strange, I know…). 16. I invented my own board game called “Multiply Spy” and I am trying to get it made into a game to sell. 17. I like to crack codes. 18. I know how to whittle, I made a cane for my grandmother. 19. I don’t like rap music but I do like classical. Thank you for taking the time to read my blog!!!!!!! Thank you! I hope you like the blogs I nominated! We were at a petting zoo a couple years ago and there were machines were you could buy food for the animals. As soon as I put a quarter in the machine the chickens started running over to me and when I got the food in my hand I was surrounded by chickens then the turkey came running across the yard and I ran the other way because I was a lot smaller and the turkey seemed big. I didn’t think to drop the food! I hid behind my Dad. 🙂 The place where I got the parts for my prototype for my game is http://www.boardgamedesign.com/ . They also do game design. I am still getting people to play my prototype so I can make changes to it. That’s cool you have a game idea! Thanks for the link, Erik! I’ll check it out! Congrats on all your lovely awards…you certainly deserve it! AHK! I am really sorry!!! 🙁 I know what your name is! I even mailed something to you!! SORRY!! I am glad you are going to tell us more about your travels! I’ll check my email! Congratulations, Eric, on all these blog awards. Go you! LOVED all your facts, you are one interesting guy. I also have ATROCIOUS handwriting! Latin is cool, what a great idea! Thanks! YAY! Another messy writer!! Congrats Erik, you’re a blogging superstar! I gave you one today too 🙂 Love your interesting facts Erik. WOW! THANK YOU Ms. Johnson!! I’ll check it out!! Congratulations, Erik! You deserve them all. And thanks so much for the Kreativ Blogger Award. I’m touched. I enjoyed learning all those interesting things about you. Classical music is by far my favorite. And I can raise both my eyebrows separately too! Thank you Ms. Fritz! I enjoy reading your blog! Congratulations on the award. What a great post Erik, I enjoyed reading your fun list — raising your eyebrows separately, bad handwriting. Wasn’t surprised that you were reading at a sixth grade level so early. With your wonderful heart and compassionate nature, I expect you to be someone who makes a diference in the world. Didn’t realize that you had made a game — hope you blog about it some time. Sounds interesting. The most interesting thing was that you learned to pick locks just so you could figure out how they work – WOW! Sounds like and engineer in the making. But, I hope you explore many things before you decide what you want to do. As you will see in my blog lists (and don’t do the math), you don’t know where your life path will lead you. 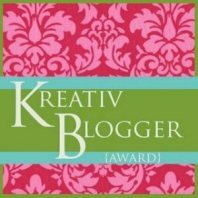 And, thank you for nominating me for KreativBlogger Awardl Wished I’d known yesterday, as I would have done what you did — combine it with the Liebster I received. Thank you for your kind comments about my blog. Thank you Ms. Tilton! I really enjoy your blog! I didn’t know you got a Liebster too! I am going to go check it out! Answered your questions on my blog Erik. Don’t know about you, but I’m tired. Am grateful for the awards, but we both got twice the amount at the same time. That was crazy!! Thank you for answering my questions I will look tomorrow because it’s my bedtime! WOW Erik! You are a fascinating guy!! I loved reading your 20 facts. Any kid who can whittle, pick locks, love classical music, dislike soda and fries, and develop a board game ALL by the time he’s 10 will most definitely grow up to be an extraordinary man! Congrats, Erik! I am new to the blogging world, but I have enjoyed reading your posts. You have lots of great insight. And thanks for the heads up on that Lego blog. I’m a 33 year old mother and have gotten into it big time because of my boys. Cheers! Congrats! I have enjoyed reading your posts…you deserve it! And thanks for the heads up on that Lego blog…I’ll have to check it out…Lego is definitely something big in our house, and I’m now into it too! I’m so excited that you received so many awards — you certainly deserve them! I’m going to have a wonderful time checking out the blogs you’ve linked to. Thank you for so many intriguing-looking ones. And I loved all the things we got to know about you. You are so cool. But anyways! That’s great that you got FOUR awards! I liked the twenty things about you! 🙂 And I have a great uncle who is Color Blind! Congratulations on the awards, Erik, and thanks for sharing the links to all those blogs! (I’m going to spend the next 2-3 days checking them out.) Your list of things I didn’t know about you made me smile. Hey, we have things in common: I love ice hockey (can’t play, but love to watch), I can raise my eyebrows separately, & I have squiggly handwriting, too. 🙂 Keep up the excellent work on this blog, Erik! Thank YOU for reading my blog! 🙂 I am glad you like my reviews! You have an AWESOME blog too! Congratulations Erik, Very well deserved. You blog has become one of the first places I go to learn about popular kids books and writing. Please keep up the good work for a long time. Thank you Mr. Granger! I am glad you like my blog! Hi Erik! This is Mason and Camille’s mom. Thank you so much for nominating them for the award! They are both super excited and can’t wait to blog about it…but have been bogged down with homework and activities the past couple of days. Hopefully they will have time to write about it today. Thank you for your comment! I am glad they are happy! OH, I have a book you might like. A gentleman wants me to review it but I am so loaded down right now, and I think you will love it. I hope any way. I’ll forward you his email. Hey, if you don’t want no problem. Let me know and I’ll look around for him. Congrats on all the awards and the love. You sure do deserve it. Never mind Erik. I think I got it as my comment posted. Taekwon Do. Right? I took that in college. I got up to a yellow belt and then other classes squeezed TKD right out of my life. It was fun. Yellow isn’t so great, but it was only one semester. If I am wrong, please tell me what TKD is. Yep. You guessed right. TKD = TaeKwon Do! I really like your blog! I hope everybody checks it out! I’ll look for the email about the book (as long as it’s appropiate for my age I’ll read it)! P.S. Sorry it has taken me so long to respond; I have been sick for a while. Thank you Sir Books! It does sound like we’d be great friends! I think it’s REALLY cool that you got new knives for Christmas! What’s your favorite thing you whittled? Hey Eric, it’s actually Christian Radio Kids.